Blitz is something that most chess players enjoy playing. Watching a good blitz battle is as exciting as any sporting competition can be. The tension build-up, the pensive pauses and the culmination of rapid fire moves are facets of blitz we all enjoy. It is no surprise that many of the top players in the world also enjoy this activity and can be seen at the Internet Chess Club in pitched marathon battles. In Moscow, twenty of the best blitz players in the world (minus Viswanathan Anand) assembled to determined who would wear the crown of the fastest player in the world. The defending champion was Magnus Carlsen, but there were many strong challengers. The tournament was a double round-robin with a three-minute time control with an extra two seconds for each move. 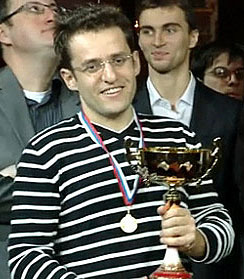 GM Levon Aronian of Armenia (above) won the event. There were 38 rounds of blitz and there was extensive video footage brought by Sergey Sorokhtin giving the exciting ebb and flow of play. Enjoy Sorokhtin’s videos at YouTube! Here are the two games of the highly-anticipated matchup between Hikaru Nakamura and Magnus Carlsen. “Kingcrusher” has some annotated videos of the above games. Yesterday Judit defeated Ivanchuk 2.5 – 1.5 to advance to the final against Topalov. Today, she beats Topalov by the score of 3.5 – 0.5! She is my favorite player, you got to love Judit! oh thanks for the info Bady ! havent seen the games yet, i dont remember them callin topy a genius though on their traditional sites. He almost managed to get a zero score that would made me a CHESS PROGNOSTICATOR!!! is he still a 2800 traditional guy on the fide scale? Naka was sick in the second half of that blitz tourny. Ya know Um startin to think that the international chess community thought that Fischer’s genius was just all about him. Do you think they beginnin to realize that its just how the U.S. is built? I was asking Susan Polgar on her site is Kasparov really a Chess Ambassador or a CHESS APOLOGIST, um not sure. Peace. ChessBase put up games with the video embedded. It’s a nice format that I can do, but it takes a bit of tweaking. May try doing a couple later tonight. There were rumours that the two giants got together after the World Blitz Championship to play a match. According to a report from Macauley Peterson, Carlsen asked him to ask Nakamura if he wanted to play 100 games. Peterson scrambled to find a set and the venue was Henrik Carlsen’s suite. They played for six hours and a total of 40 games at 3’+2″. The following video is game 38 and it is approximately 4:00am. I witnessed a similar match between GM Maurice Ashley and IM Stephen Muhammad after the 2003 U.S. Championship in Seattle. That match was 14-14 and lasted more than four hours. However, the Nakamura-Carlsen match result has been kept a close secret.